These Bacon and Feta Peas are seasoned with a buttery garlic sauce and packed with crumbled bacon and creamy feta cheese. 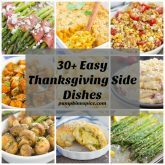 It’s an easy side dish that takes just minutes to make and is sure to be a favorite in your household! Let’s talk about peas today, shall we? Peas immediately take me back to my childhood. The smell, the texture, and even the taste…it’s almost like I’m transported to being ten years old again. I know not everyone likes peas. Take the hubster, for example. He’ll eat a pea or two, but not if he can help it. And me? Well, I like peas, but it’s one of those vegetables that I never make and only seem to have when they’re mixed into soup, fried rice, or a casserole of some sort. It’s almost like peas are the forgotten veggie of the greens. Agree? Unless you’re a pea fanatic, I’m guessing you feel the same way. Well, all of that is about to change today. I’m ready to bring some new life to peas and declare it as one of my favorite side dishes thus far. That’s a pretty bold assumption, but once you taste these peas, I think you’ll agree. 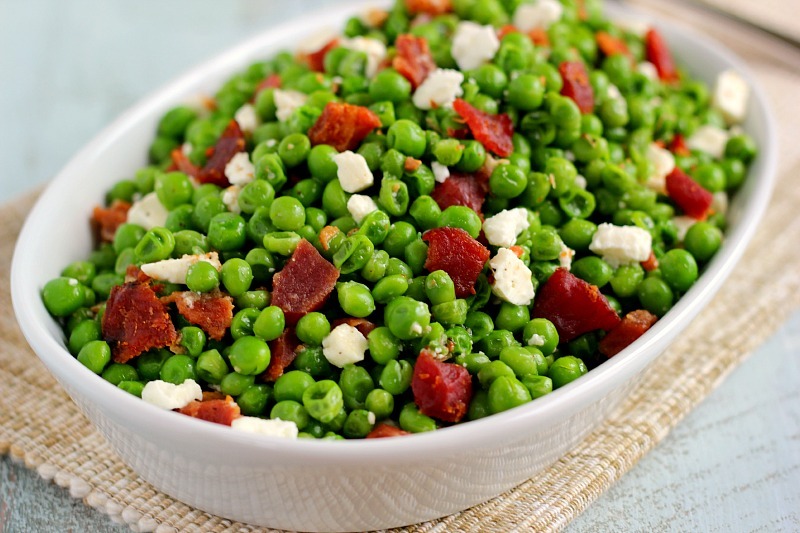 If you’re looking for a new way to reintroduce peas into your diet, then these Bacon and Feta Peas were made for you! The flavorful sauce, smoky bacon, and tangy feta combine to create an irresistible taste that is sure to please even the pickiest of eaters. Proof: the hubster ate these peas! He even had a second helping, which is saying a lot. And if you’ve been hanging around here long enough, you know that the hubster is pretty much a meat and potatoes kind of guy. 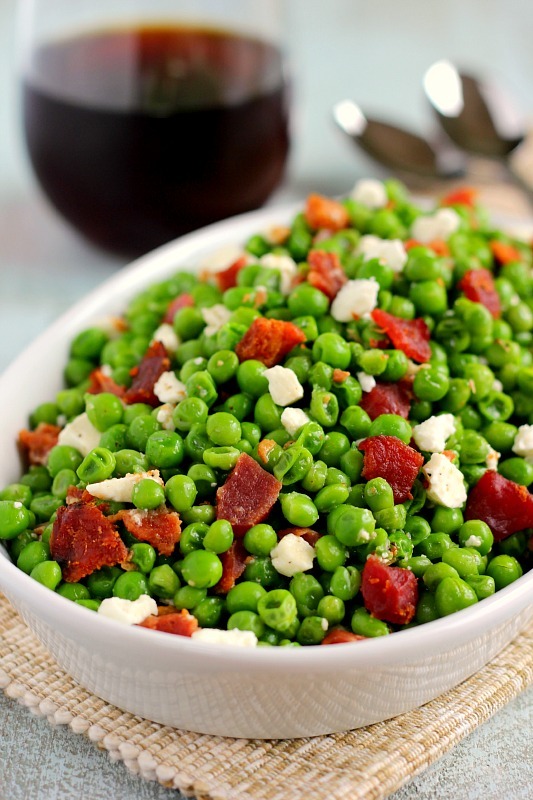 Bacon and feta may seem like an odd combination for peas, but trust me, it’s so good! Especially when it’s combined with a buttery garlic sauce. Mmm mmm good! And like most of my recipes, these Bacon and Feta Peas are ready in less than 15 minutes, and that includes prep time! What could be easier than that? So the next time you’re looking for a flavorful veggie to go along with dinner, these Bacon and Feta peas will do just the trick! Flavorful, delicious, and ready in no time, this dish is sure to be a crowd-pleaser! Bring 2/3 cup water to a boil in a medium saucepan. Add peas to boiling water, cooking for 5-7 minutes, or until tender. Drain water from pan and keep about 3 tablespoons water in pan. Add butter to peas and stir until melted. Add in garlic powder, bacon, feta cheese, salt and pepper. Stir to combine. This peas dish looks divine and SO vibrant Gayle! I LOVE your new site redesign - it is STUNNING yet adorable at the same time!! Okay, confession. I don't do peas. But if I did, feta would definitely be involved! And I do love the colors, too. anything with feta is always going to be good with me, but it's so creative that you have put it with peas. Not something iI would have thought of! Thank you, Dannii! The feta gives these peas such a nice flavor! I loooove peas especially this time of year in a pretty side dish like this! 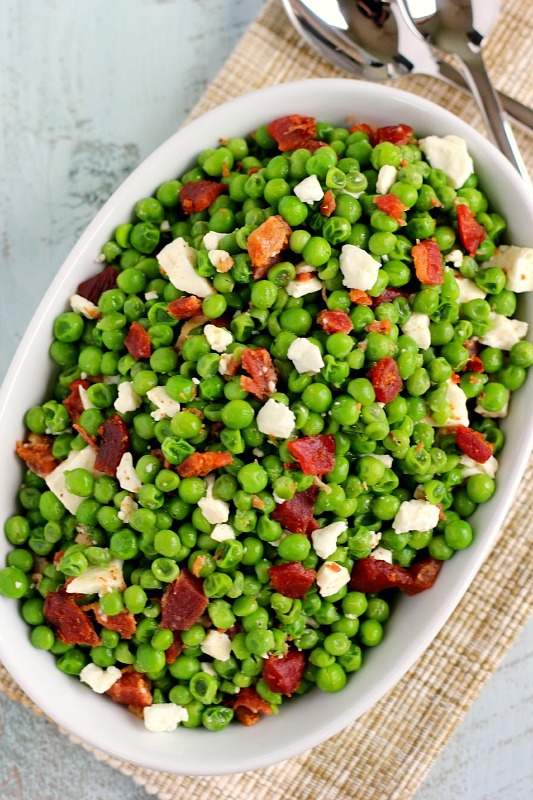 I mean, how could you not LOVE peas when they're hanging out with bacon and feta?? This would be such a good side dish for the lamb roast I'm making today! I was never always a big fan of peas until recent years when I tried frozen peas. Now, I LOVE them. Love the pop of freshness and colour they add to a recipe. This one is a perfect Spring side and how can you go wrong with the addition of bacon and feta :) Pinning! Thanks for the sweet comment and pin, Dawn! I always forget how much I love peas until I make them. They're so delicious in salads, too! I actually LOVE peas, but my husband would rather not. If I'm having a lazy night and just want pasta, I always mix peas in for a little green :) But who wouldn't love peas when combined with bacon and feta?! Sounds like your husband is a lot like mine! 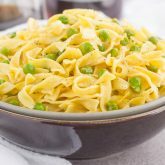 And yes, peas are SO delicious when mixed into pasta! Thanks for the kind words, Sues! It cracked me up when you said your hubby will only eat a pea or two! hahhaa! That's great! This is actually one of my favorite side dishes! And what I just realized is I don't make it enough. 'Cause me? I'll eat at least 30 peas...at least... Thanks for sharing, Gayle! Haha ok maybe he'll eat 5 or 6, but that's his limit! :) I will eat at least 30 peas, too! Thank you, Annie! Yes! Bacon makes everything better. Thanks, Blair! I've rediscovered my love of peas lately. I love buying the bag of fresh english peas from trader joe's. Love that you added bacon to them, bacon makes EVERYTHING better, right? Oh I'll have to try those peas from Trader Joe's! And I've rediscovered my love of them too...they're good in just about anything! Peas remind me of my childhood too. I actually really love peas and could eat them all the time, but I try to have some other greens too. 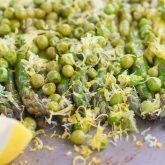 I love that you made a fun and delicious side using peas. And well anything with bacon in it is awesome! Have a great weekend friend! Hugs!! Thanks for the kind words, friend! Happy weekend to you, too! I love peas! But, I don't cook them very often, because my husband hates them... Will definitely try this recipe! Have a nice weekend! It sounds like our husbands are a lot alike! Thanks for the kind words, Mira! OMG, yum!! 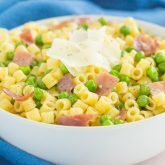 As soon as I read the title of this post, I could imagine how the sweet peas would pair SO well with the salty feta and bacon. I love peas but don't use them nearly enough. I need to make this soon though! Haha, peas are the veggie that I will stick into almost anything. I had a curry the other day that was about half peas, I think. ???? This is definitely up my alley. 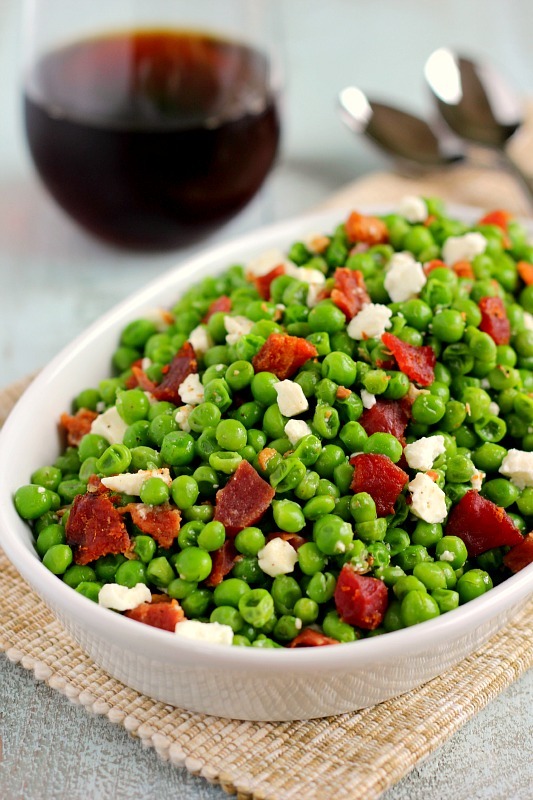 And who could say no to peas wih bacon and feta cheese, right? Perfection! Thanks for the kind words, Amanda! I love how versatile peas are, too! I love peas, this sounds wonderful and so fresh!